The eternally cheerful and supremely confident preserving wiz Susan Baker, Warhol-style. For a long period of history, bottling was the main method of preservation of foods – and there doesn’t seem to be much “specific” history of it in New Zealand since it is obviously not endemic; and therefore didn’t have much of a separate development geographically. 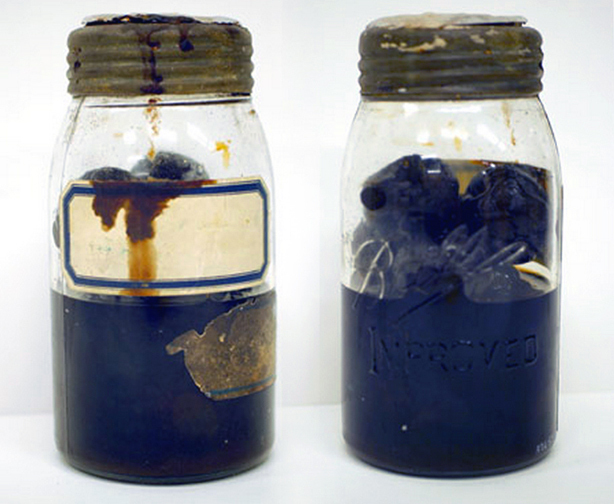 It is what it is; stuff in jars, found the world over – even the earlier traditions of potting, drying and smoking of Maori culture weren’t that different from any other parts of the world. 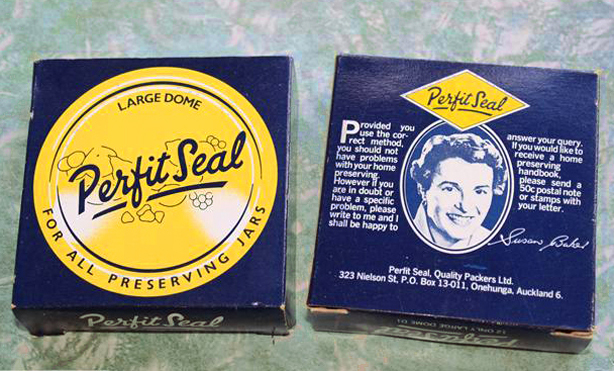 Perfit dome lid box, by Quality Packers (Q-P), probably produced in the late 1970s-late 1980s. The booklet price is listed as fifty cents at this time. Although, Professor Helen Leach, a food anthropologist and historian from the University of Otago, reckons the history of it is, inexplicably, far more enduring in Aotearoa than that of the U.K. or U.S. She does have her suspicions as to why, though. I listened to an interesting broadcast on the topic where she skirted around the obvious economic issue; we’ll get to that in a moment. 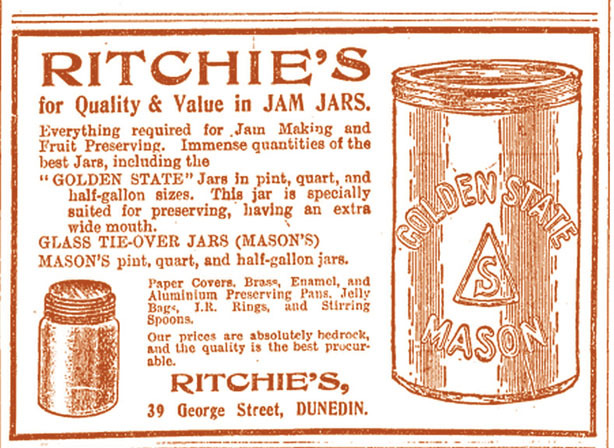 Ritchie’s preserving supplies, Otago Daily Times, February 1920. It was a given that the accomplished housewife would have a skilled knowledge of cooking and preserving. Sometimes hundreds of pounds of produce were ‘put down’ while it was in season. Anything that could be saved for later, was – even pickled eggs, which sound kind of revolting now – were quite popular for a number of decades, as anyone who watches Boardwalk Empire would have observed. Anyway, there is likely a lot more to it than sheer financial reasons, but I know my mum did an awful lot of bottling for that very reason – we could “pick-our-own” produce locally in the semi-rural area where we lived for very little – the kids would be put to work coring, peeling and chopping in preparation – and we’d have a greater variety of food for later in the year at a low cost. I can say as far as our family, it certainly was not done for any sense of accomplishment or sheer joy as the alternatives suggested. 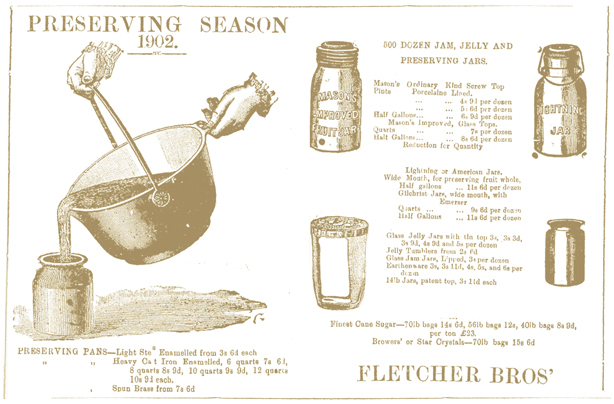 Fletcher’s preserving supplies, Ashburton Guardian, 13 February 1902. NZ History online states New Zealanders had an “obsession with bottling (and) good housewives were expected to know…” This is a bit like saying fruit grows on trees under a blue sky, since in those days it was more a given necessity than a pastime of any sort. Also – thrift, or even the exhibition of it – through perceived activities such as home arts in the culinary manner, was seen as virtuous. 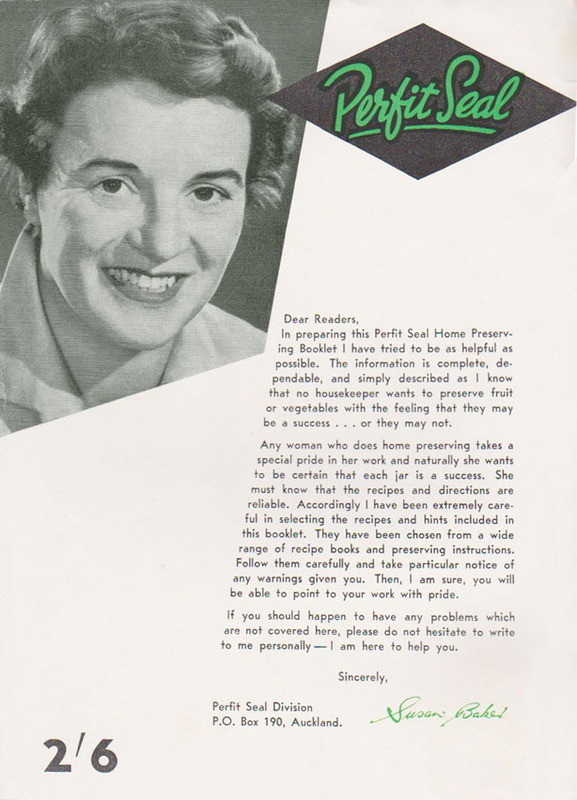 Ergo, there was hardly an exception when it came to cookbooks including extensive sections on this prudent approach; as well as a plethora of them completely devoted to the topic. Back of small orange G dome box with the booklet price listed as 30 cents. This indicates it probably dates from the late 1960s – early 70s. Domestically-based commercial canning and bottling of foodstuffs was beginning to become prevalent in the late C19th (Kirkpatrick’s “K”, Thompson and Hills‘ “OAK” , Irvine & Stevenson‘s “St George” to name some ) – however this did little to dull the ardour for home preserving – which flourished, although the technique probably may have had a significant downtime in recent decades with a notable nosedive in the 1960s (yet, Perfit claimed that in the mid 1960s Kiwi women were still squirreling away twenty million bottles per annum collectively). Front of small orange G dome box above. Manufacturer is Finch & Co. The drop-off was due to a number of factors. The advent of easy accessibility to home refrigeration and new-fangled methods of freezing food meant perishables, where possible, were chucked in the ice chest to use as needed. Mass advertising of goods that became more prevalent in the 1950s began to capture an audience to branded product; and the corporatisation of just about everything possible seemed to be on the rise from the early 1960s (what big business wants people doing it themselves? There’s no money in that). By the time these factors were combined with a marked rise in time poverty – especially because of women entering the workforce full time in droves – there was no real chance of recovering the decline and ever going back to those halcyon days. 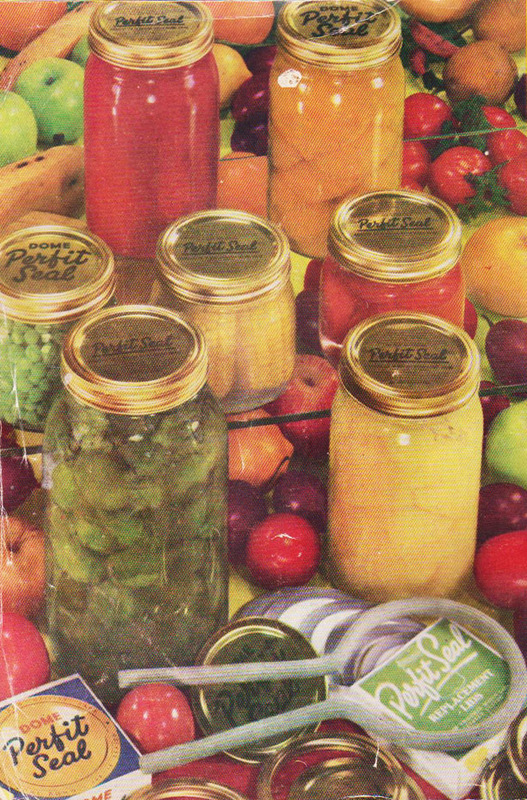 The Perfit home preserving book was published in at least four editions through the 1960s and 1970s, and was available for a nominal price by writing to the company. However that has not at all stopped enjoyment of the same products over time – whether home or factory made. And it has certainly had a hobby revival in the last few years with the re-trending of vintage Kiwiana and home cooking – as people have a yearning to get back to old-fashioned ways, signifying simpler times and other unfounded romantic ideas that enter their heads. “It did have a bit of a lull for a while, but it’s never really gone away”, says Marjorie Symonds, one of the current owners of Perfit. Back of large blue dome box. This probably early 70s as booklet price is now five cents up from around 1968. 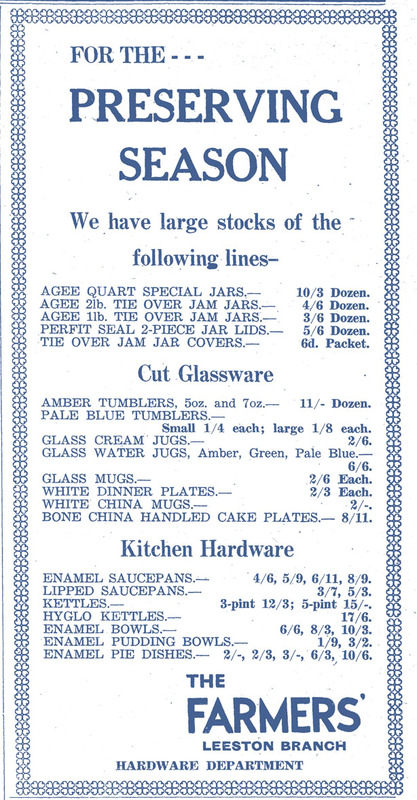 Preserving memorabilia is in a little category of its own, not quite lumped in with food and drink products, but associated kitchen ephemera – “cooking stuff”. 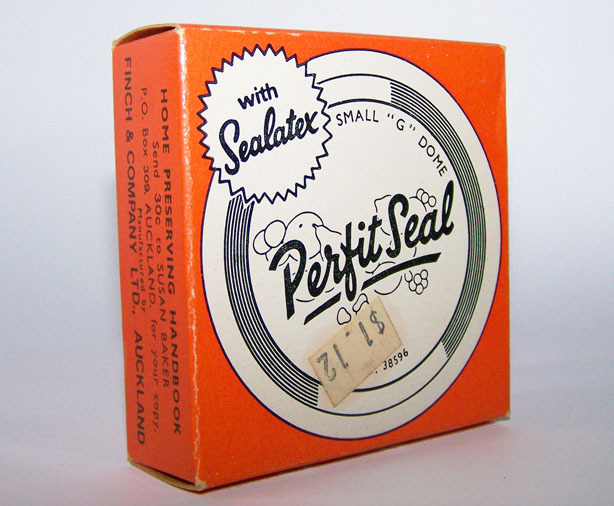 Brands of bottling gear were imported (Atlas, Mason, Fowler, Ball, Mason to name some) and a lot of companies got in on the lucrative preserve seal/ cover act like Reidrubber, KB (by IGA ), Deeko, and Jet Set (by Lane Latimer who were well known for their King brand of foodstuffs). 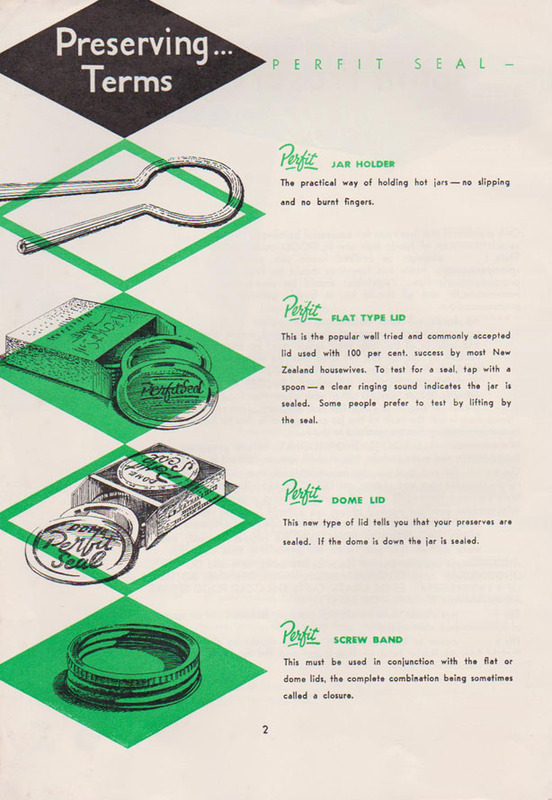 There was Four Square and Pam’s (by Foodstuffs NZ Ltd) as well, but the two most popular were domestically produced brands Agee, and of course Perfit – which is in the oeuvre of an iconic NZ brand remembered by a number of generations. Front of large blue dome box. 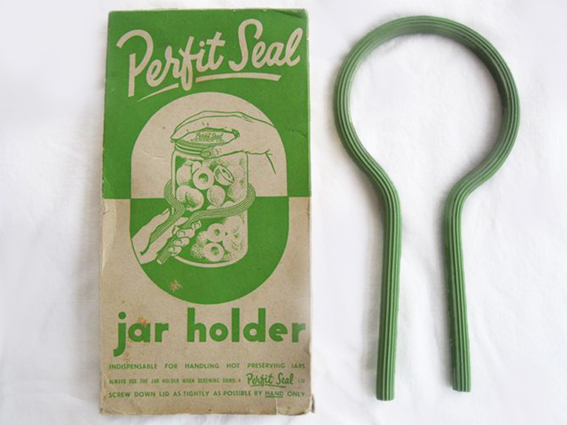 Manufacturer is Finch & Co.
Perfit is an old French /British surname which originally stems from “Parfait” although the name of the brand seemingly has nothing to do with that and is simply an amalgamation of two words – “perfect” and “fit” referring to their function as a superior method of sealing preserved goods. 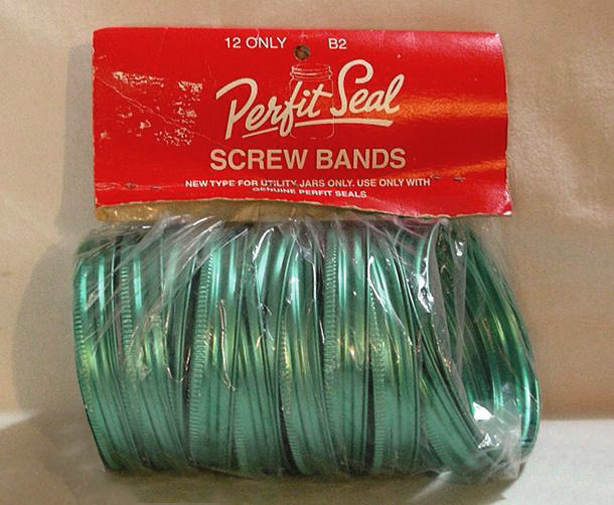 Perfit screw bands during the period they were sold in plastic rather than the classic box. For decades Ms. Susan Baker, Perfit‘s ”home preserving consultant” has beamed beatifically from the cartons, with a confident glow that says “of COURSE you can do it, and all your efforts will turn out perfectly, so I’m not expecting a letter from you.” However if you ran into problems, she was at your service ; you could write to her, and she would do her best to answer. 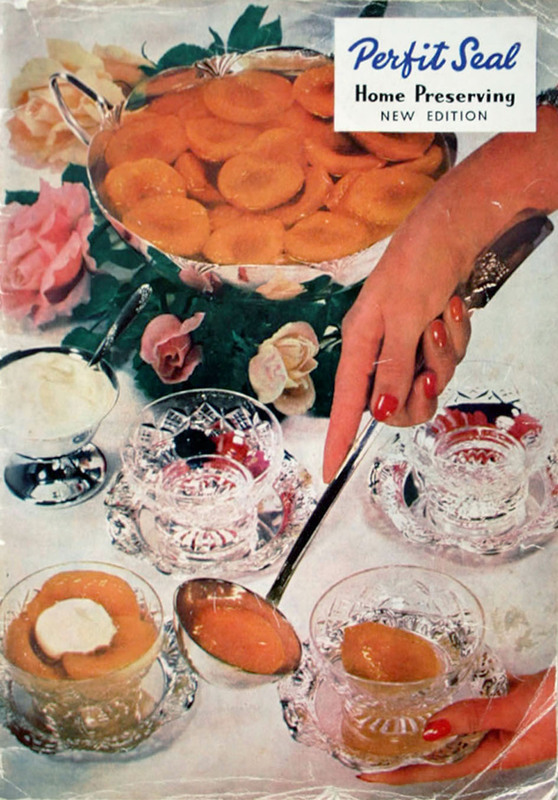 Oh – and also, for the nominal fee of a few cents, send you a home preserving handbook ( which was being produced in the 1960s and 1970s that I know of, and also L D Nathan & Co Ltd. had produced an earlier one, thought to be from the 1940s that is in the MLNZ ephemera collection). I always imagined her sitting on a spindly, high stool at her little wooden desk in the high-ceilinged Perfit warehouse somewhere in a 1950s-looking industrial division in South Auckland, with a few reference recipe tomes book-ended, and a soft lamp at her elbow, earnestly answering letters from housewives as storemen bustled around in the background preparing orders. So who was this Susan Baker, that, if you were like me – was gazing back at me every time I opened the cupboard that held the Edmonds jelly crystals, Gregg’s spices, Maggi stocks, cake decorations, and bits of preserving gear? She became an unwitting icon of our childhoods. Yet, we knew nothing about her. 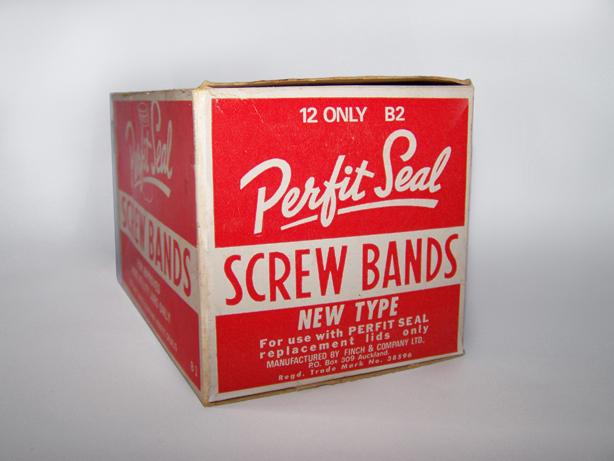 Perfit screw band box showing contents. This looks like a recent revived version of the box. 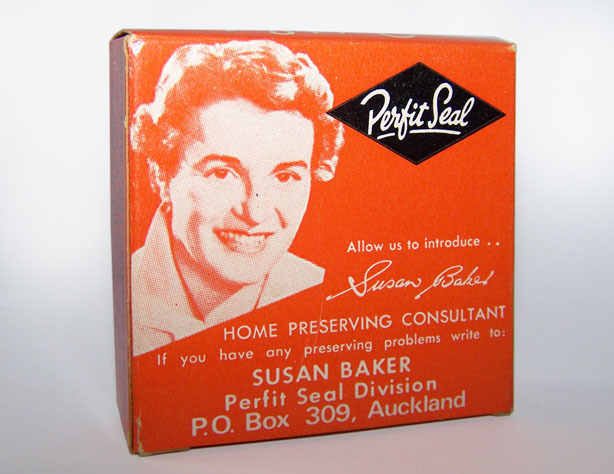 As it turns out – Susan Baker was not a real person – she was invented by the marketing department of the time. 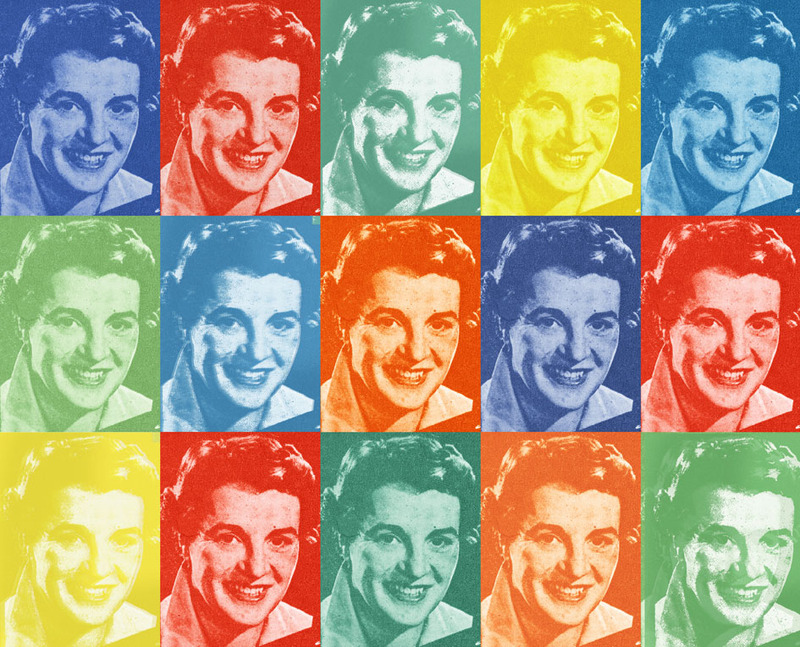 “She was a fictitious character, made up when Unilever had it. They just picked out a name and put the picture of some lady on the box. There was no such person as Susan Baker”, says Marjorie Symonds, who with her husband Don acquired both the Agee (in the late 1990s) and the Perfit brand in 2000. In reality, it would have been employees like Diane Horne , who, working at L.D. Nathan‘s Fort Street building in the 1960s – who answered the inquiries during her tenure working for Ray Lowe in the Perfit Seal Division. 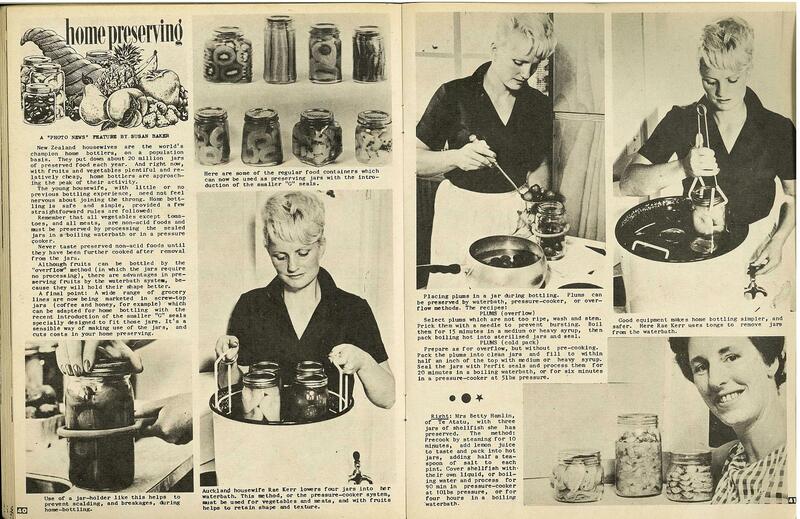 Home Preserving article by Susan Baker (apparently) for the Nelson Photo News, No 75, February 4, 1967. 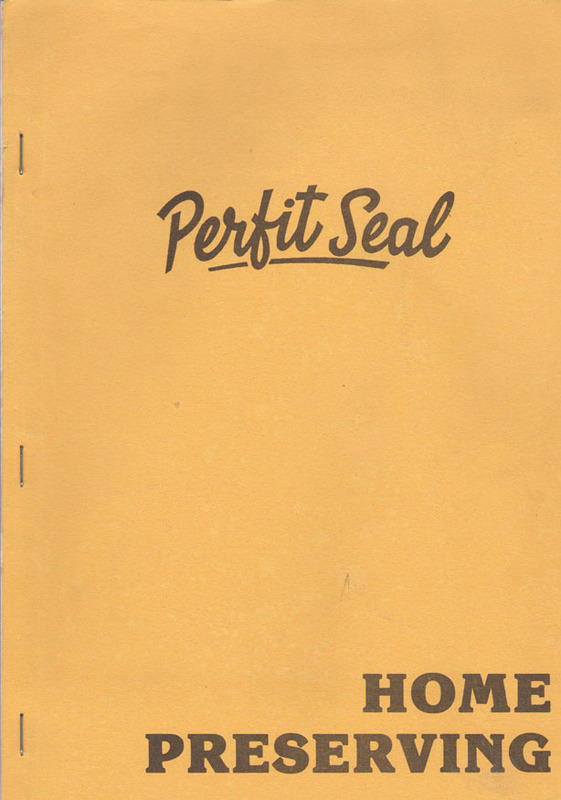 I can’t say for sure but the brand was likely created by Nathan ( today the international behemoth based in Australia –Lion Nathan Limited ); when it was known more formally as “The Perfit Seal” – the earliest ads I can find mentioning the Perfit product are 1944-1945. 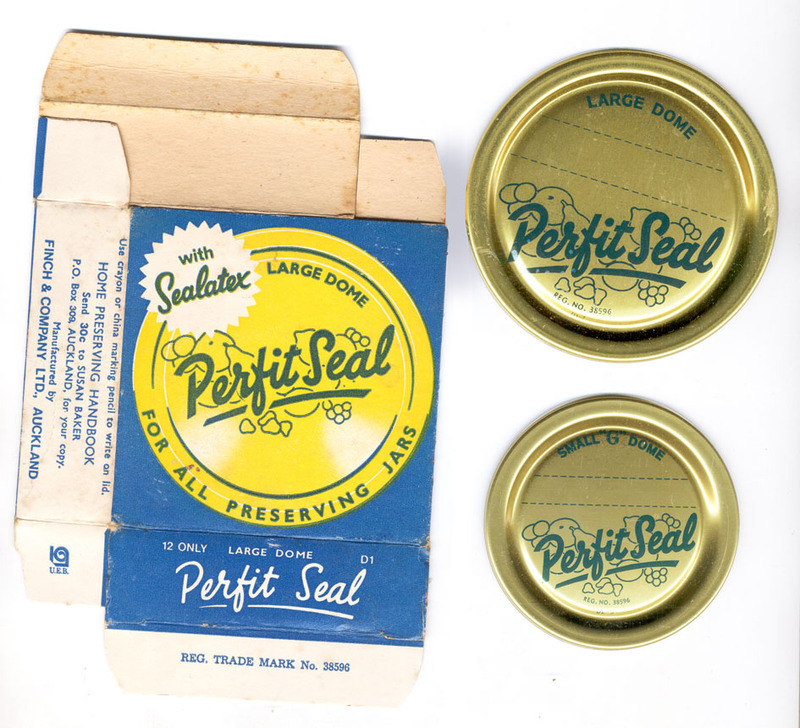 Museum collections show preserving jar seals by that company from the 1950s but do not mention an actual brand name. 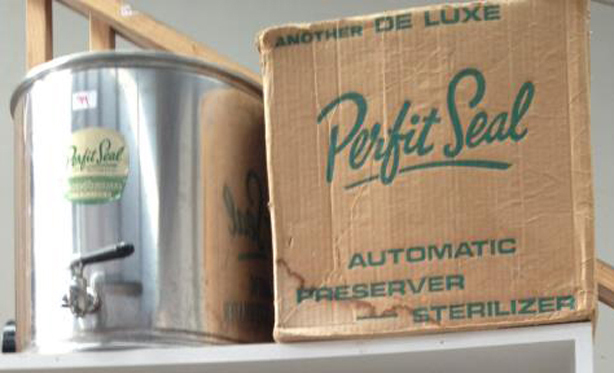 An early version of the Perfit auto preserver with original box, waiting to be auctioned in Havelock North last year. This one is probably from the late 1950s-early 1960s. Image courtesy of Kauri Auction House. 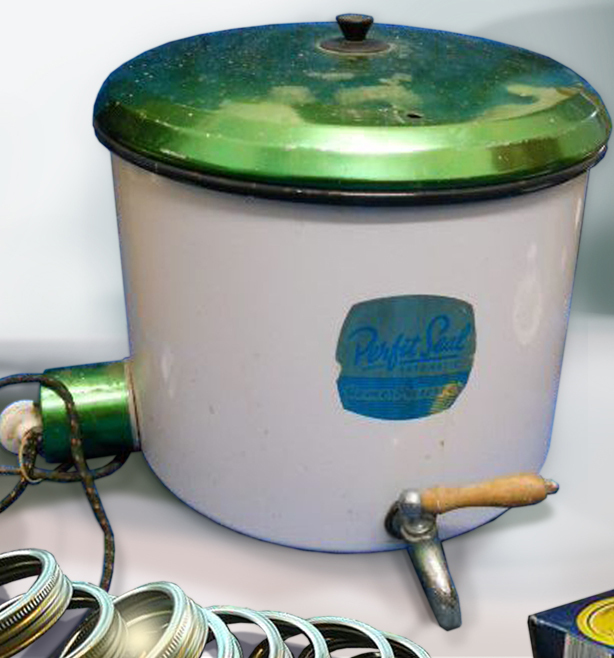 A late 1960s version of the Perfit auto preserver. 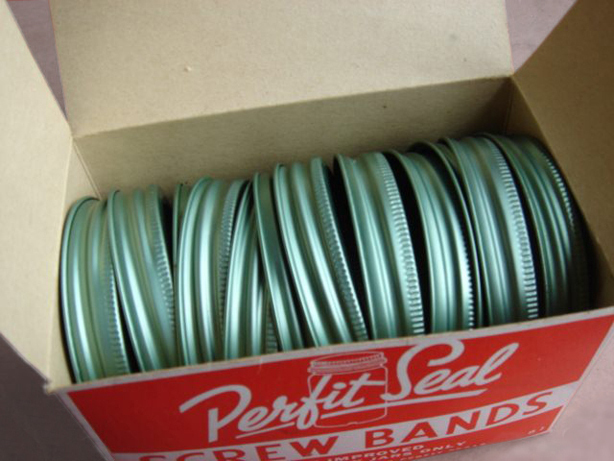 The recent revived version of the classic blue Perfit screw band box. Most of these items are from my own personal collection. Eventually like everything domestic that was hanging on, the factory could no longer compete with foreign manufacture and the new owners of the brands had to look overseas for another component fabricator . “Eventually they closed manufacture of the line down, hence why we now import them”, says Don. These days the product comes from Canada. An early mention of Perfit in the Ellesmere Guardian, February 1945. I’m not sure when Perfit was on the market but I am assuming that it was at the end of WWII. 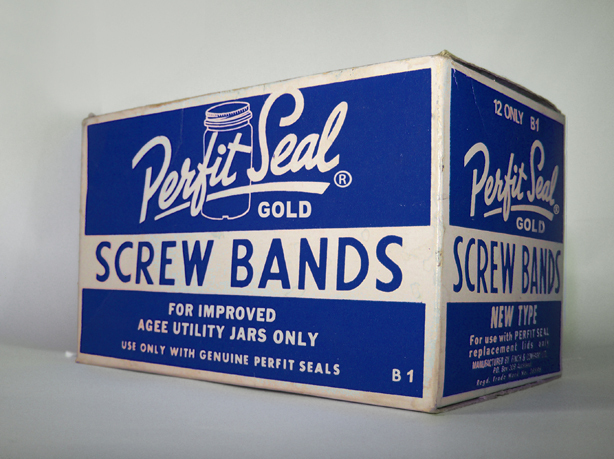 This smaller screw bands box was a tie in product with W. Gregg & Co is probably around 1967-68 as the stamped price shows both decimal and imperial currency – indicating it was produced when the conversion was recent enough for people to still be confused. 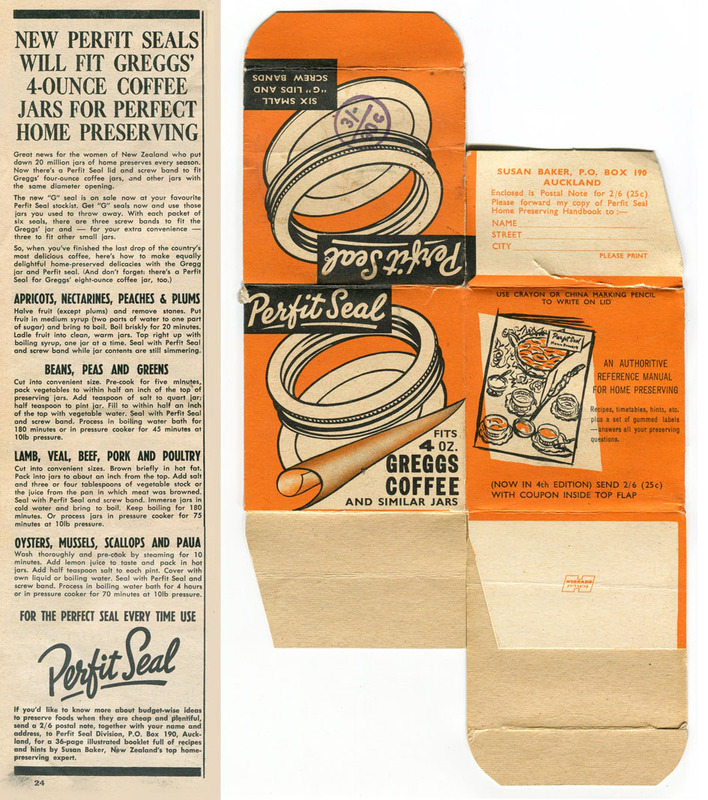 An advert of January 1966 explaining that special edition screw bands are now available to recycle 4 ounce Gregg’s instant coffee jars to use for preserves. The box indicates the Perfit preserving book is now in its fourth edition. This is the earliest reference I can find for it, though – at 25 cents. 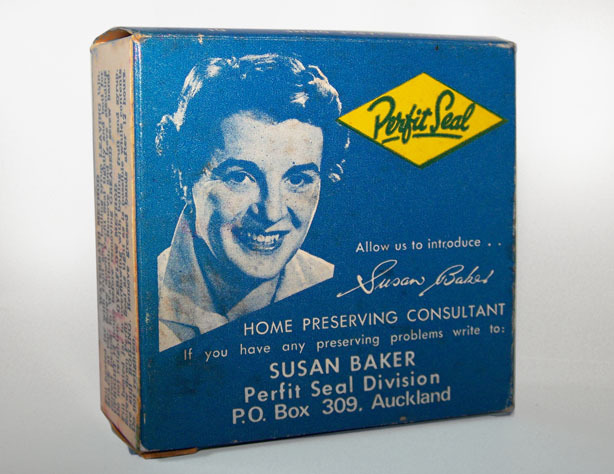 The Perfit brand name its self wasn’t registered until 1960 by L D Nathan & Co according to IPONZ records, and interestingly, it doesn’t seem that “Susan Baker” was ever registered. 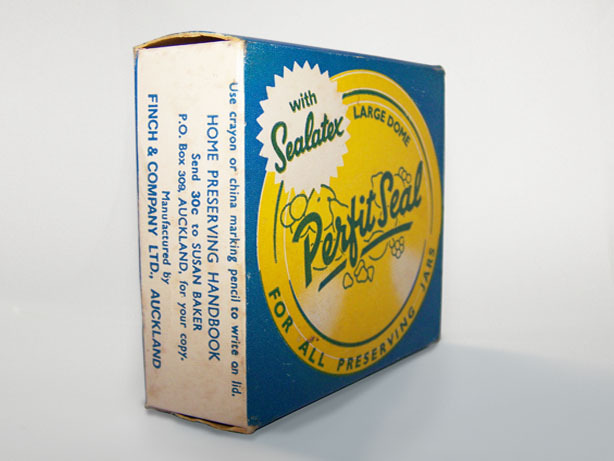 An early box of Perfit G Dome Seals made for L D Nathan sold recently on Trade Me and showed that the instruction book price had risen to fifty cents. This indicates it was produced post 1967 decimal currency introduction, and so that information tells us it was after that time Nathan on-sold the business to Unilever. A trademark registration, with no party named, shows up for the product in 1972; this seems to match up with the year of some acquisitions and changes at L D Nathan who may have decided to divest their interest in – what they likely considered at the time – a waning brand with limited future. A look at the design for the metal domes – early-mid 1970s. It now seemingly stayed with Unilever through to 2000, although one box I have is marked “Quality Packers Ltd” Nielsen Street, Onehunga ( a company founded in the 1930s who were well-known for their “Q-P” baking powder, and later also produced a serious Kiwi foodstuffs icon – Choysa tea, as well as Roma).Choysa (established in 1905) came from Bond & Bond, whose company became “LD Nathan Wholesale Ltd” after it was purchased by them around 1972, as Christine Cox, a former employee, remembers happening while she worked in the L D Nathan offices in Auckland central. Box for the Perfit jar holder – it was a rubber-sheathed loop used for lifting bottles in and out of the auto preserver. Eventually, the Choysa brand was moved over from LD Nathan Wholesale Ltd to Quality Packers, (which Nathan had also snapped up around the same time) to handle. Clearly Perfit was eventually slotted in under the QP division in the 1970s-1980s for reasons we don’t really know. Perhaps it seemed to be in marketplace competition with another of the numerous brands Unilever owned – or perhaps QP were just better equipped in some way to handle such a product. It could have been a myriad of reasons. So that’s how Perfit ended up being “produced” by QP. Quality Packers were liquidated in 1993 and then struck off the following year (it turns out 100% of the shares were owned by Unilever at the time) and yet they decided to retain the Perfit brand for a few more years until they finally decided they’d had enough of it. 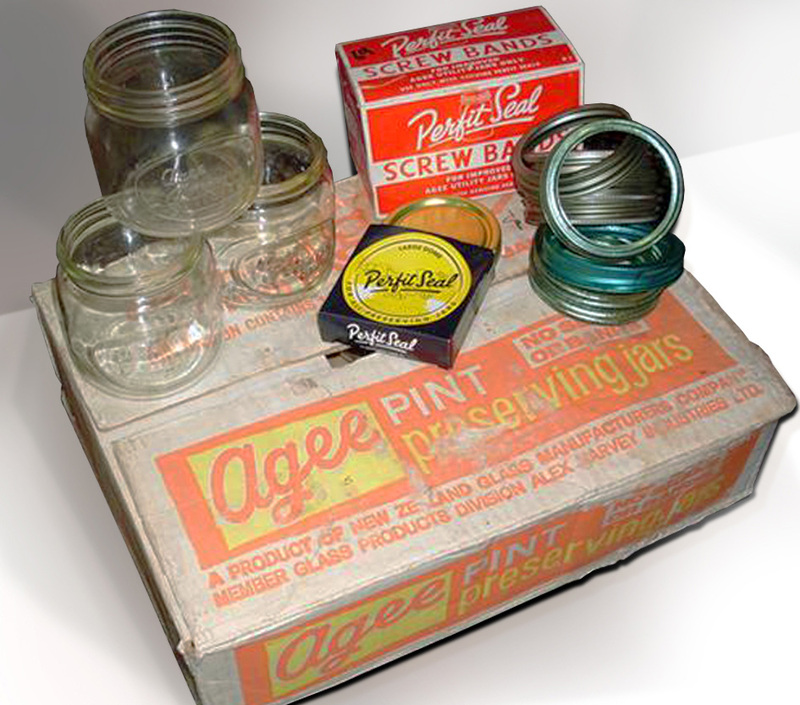 A variety of Agee and Perfit preserving products. 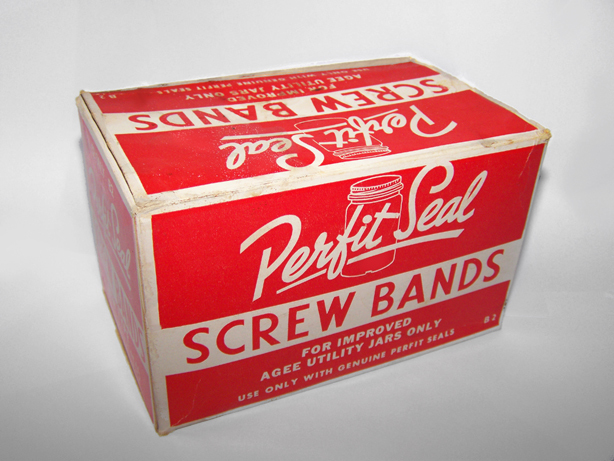 An original version of the red screw bands box, probably early 1970s. I’ve got quite a collection of the various boxes that have been issued over the years – including one that is specifically marketed for its ability to fit on a certain size of Gregg’s coffee jar that people were taking it upon themselves to recycle and use for preserving. 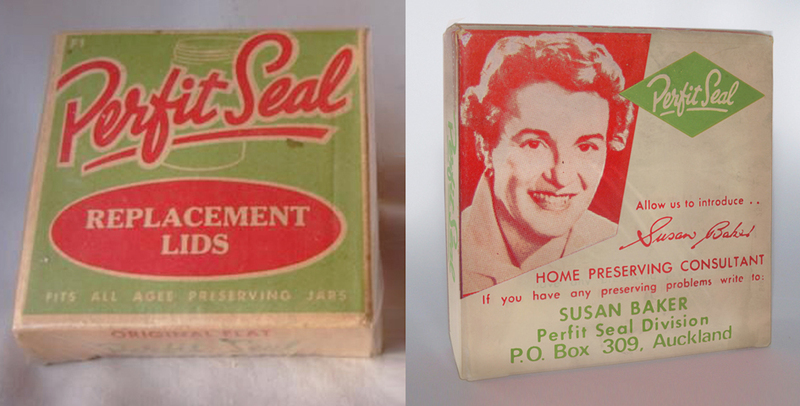 I’d noticed that recently a lot of the older style boxes were cropping up – but in fact seemed to be a recent product. “We’ve gone back to the two older boxes, the ones that originally came out the forties or fifties. So the ones that are on the shelves now are the original box designs they used many years ago”. It’s good to see that every once in a while a company is upholding its own history and celebrating it, even if it’s in small ways. 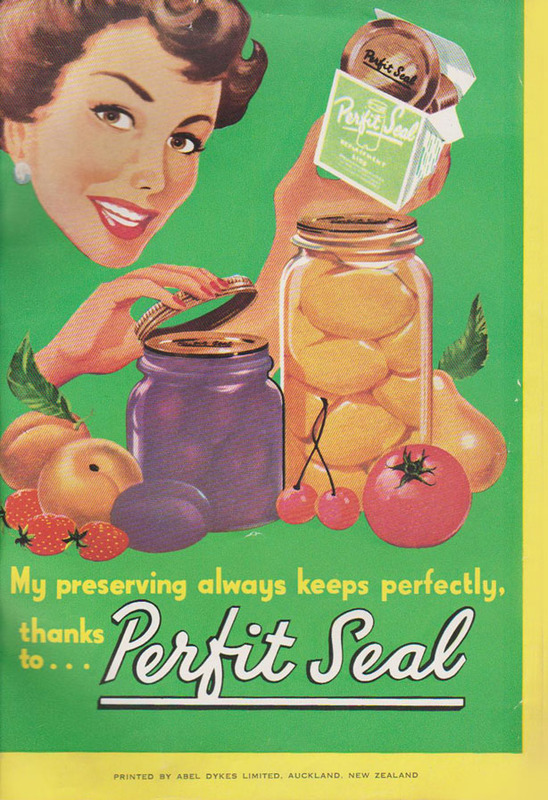 An early mention of Perfit amongst the preserving range on offer at Farmers”. Ellesmere Guardian, February 1945. Addendum, early Aug 2013: I had been trying to save up some good images for years for this article, and then of course just the week after I posted this article, someone immediately came up with a couple of much better ones, including some of the Perfit auto preserver and the jar holder with a good shot of the box it came in. I’m not sure what to make of this seal box. I’ve never seen this version before. Presumably it’s a little older than the others I’ve featured – probably early 1960s, maybe even late 1950s. But who knows for sure. Also, who knows why exactly they needed so many different boxes for what was essentially the same basic product! Addendum mid Jan 2014: A Dunedin collector and reader of this blog kindly sent these images to me as a contribution the article. These arrived some months ago and I haven’t had time for quite a while to do all the updates I need to get around to. 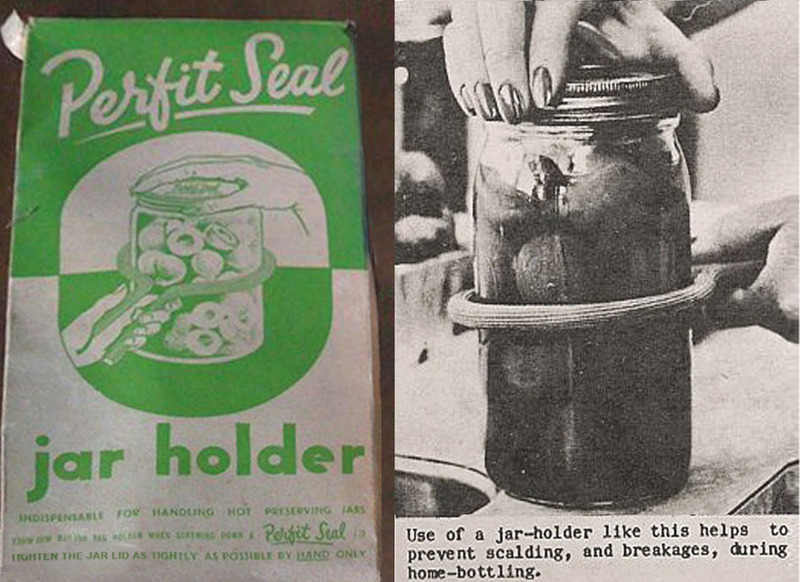 I’d say these pages come from two different editions of the Perfit Seal Home Preserving booklet: early 1960s and another from the mid 1960s. Unfortunately all are undated so it’s pretty difficult to tell bar the use of imperial versus decimal currency, which gives a general clue. I’ve never seen either of these versions before – just what I think of as the “regular” version that I posted in the article above, which seems to crop up on a regular basis. Anyway, for the most part they are interesting pages with some colour. All following images are courtesy of Owain Morris collection.